Research and practice in the vast field of school-family-community relations have evolved dramatically over the last thirty years. Schools throughout the world face enormous challenges due to demographic changes and societal problems, making partnerships among schools, families and community groups a necessity. Specific issues such as poverty, school dropout, violence and suicide, the wider diversity of students and parents, the higher accountability demanded of school systems, the implementation of school reforms and a multitude of government strategies and policies all contribute to a rapidly changing educational world. But as this book shows, even though research is often being undertaken independently in different countries, strong similarities are apparent across countries and cultures. School-family-community collaboration is no longer a single country issue. the work of schools with migrant groups, low-income parents and parents with behaviour problems. With contributions from distinguished researchers from throughout the world (including the United States, Canada, the UK, Europe, China and Australia). 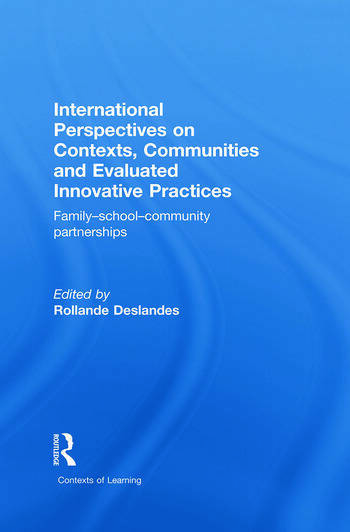 It is a perfect companion to International Perspectives on Student Outcomes and Homework, also edited by Rollande Deslandes, and published simultaneously by Routledge. Rollande Deslandes is a full tenure Professor in the Department of Education at Universite du Quebec a Trois-Rivieres, Quebec (Canada). She received a Research Excellence award from the University in 2004. For several years she has been involved with the American Educational Research Association (AERA) Family-School-Community Partnership Sig, the European Research Network of Parents in Education (ERNAPE) and the Association Internationale en Education Familiale (AIFREF).